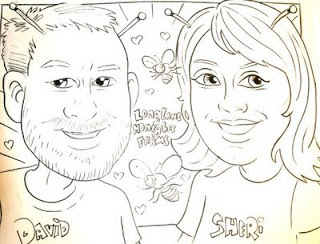 Hi, we're David and Sheri Burns owners and operators of Long Lane Honey Bee Farms. And we look alittle bit like this caricature drawing that was done of us at our last honey show that we did in Danville, Illinois. Those aren't devil horns sticking out of our heads, they are little bee antennas. You'll see a widget to the right of this article where you can click on the file for Tuesday and hear it. Sheri and I work hard at being kind, polite and cordial beekeepers. We try very hard to treat our customers as friends and family. We believe we should treat others as we would want to be treated. Having said that, I feel it is time to write a lesson of a different nature. We talk alot about wanting gentle bees, but every now and again beekeepers need that same expectation placed on them. We should be gentle too! I received a phone call last week from a nice gentleman from another state who is wanting to get started keeping bees in the spring. He spoke with a man in his area, a commercial beekeeper to get some advice. But the man was pretty negative and felt alittle intimidated by "another beekeeper" who he perceived could be cutting in on his business or territory. For the most part, the beekeeping community is matchless when it comes to kindred spirits gleaming with encouragement, camaraderie, and cordiality. Yet, like with every group there can be competition, strife, jealously and fear. And some beekeepers have to prove they are the smartest at the meeting. Beekeepers are a bit proud of the knowledge that they have gain because most of us have gained that knowledge and wisdom at a great cost to our pocket books and our total hive count. Or we've paid hundreds of dollars for various beekeeping courses and conventions we've attended where we've gained our knowledge. We want a pat on the back for all that knowledge we've gained. Sound like someone you know? Ill-tempered full of resentment and stubborn notions. Avoid these kinds of beekeepers. They are out there and they are ready to tell you how stupid you are for listening to some other beekeeper or for buying your equipment from one place and not the other. Some will tell you of all the insurance you have to have in case your bees should sting a customer and on goes the list of expressed fears. Sometimes they don't even have to say a word, but they just give you that look, that makes you feel that what you've just said is stupid and ignorant. Behind your back they'll snicker and say things like, "That's the stupidest thing I've ever heard. His bees are going to die if he tries that..."
Almost every association has atleast one curmudgeon. And one is all it takes to silence the eager student from asking genuine questions. One is all it takes to cause an association to be poorly attended. There's not much we can do for the few curmudgeons out there. You can requeen a mean hive but you can't requeen your association from the curmudgeons. 1) Be nice, friendly and encouraging to other beekeepers and to everyone for that matter. 2) Speak up at your association meetings. In a kind and nice way, try to refute the curmudgeons negative outlook. Share what is positive and what successes you are enjoying. 3) When a curmudgeon gossips about someone else, stop them right there. Do not listen. If you listen and say nothing, even your silence is taken as agreement with them, so don't be silent. Speak positively. 4) Perhaps in a humorous way, you can ask the curmudgeon if he or she might consider requeening their attitude. "Why do you keep bees if you are so down on things anyway. I think you need to get out of beekeeping or requeen your attitude". 5) Each association should give out an annual award for the most kind, helpful and encouraging beekeeper among us. 6) When negative things happen to you, like your hive dies, look at it from a positive point of view. Look at what you learned from the bees that you can apply next time and do better or try a different approach. 7) Contribute to your local association. Don't just show up with a chip on your shoulder because you have family or financial issues. Leave those behind and come with something encouraging and positive to share at your meetings. 8) Think back to when you first started keeping bees. You had to work hard to find answers. So look around and find those new to beekeeping and mentor them and help them along with positive and encouraging advice. 9) When you think you know it all, and you badly want to share it, bite your tongue and try to learn more. Mark Twain once said, "It is better to keep your mouth closed and let people think you are a fool than to open it and remove all doubt". 10) Keep learning. You'll never reach a point where you know everything about beekeeping, so remember that though you may know more than some, lots of folks know more than you. So keep learning. So, remember to be positive and supportive of other beekeepers. Why not share some equipment or if a neighbor beekeeper loses some hives in the winter and you didn't, why not give him a hive or two. After all, you could have lost those hives anyway. If your life is filled with hardships and negative happenings, perhaps you need to focus on something positive. Why not listen to our new Studio Bee Live Beekeeping Broadcasts! Sheri and I have fun sharing silly things and smart things that we do on our honey bee farm. We'll give you information on beekeeping as well as make you smile. Just log on to: http://www.honeybeesonline.com/studiobeelive.html or click on the player in the upper right side of this blog. 4)We love to answer your beekeeping questions and now we have a new line just for questions. 217-427-2430. Call that line if you have questions about beekeeping, but call our other line to place orders. The order line is 217-427-2678. When you call in with your question, we'd love to play your question on our broadcast along with our answer. So, when you ask your question, and it's okay for us to use it on our broadcast, just say, "Hi I have a question for studio bee live..."
Finally, now that it is November, here is what you should be doing with your hive. NOVEMBER AND THE BEES: The bees continue to cluster for winter. They may not yet go into a full winter cluster, and may actually develop two clusters. They may break cluster frequently on warm days and recluster at night. But they will begin to cluster for the winter. The days are getting much shorter. The queen will lay less and less. NOVEMBER AND THE BEEKEEPER: Feed your light hives as long as the sugar water doesn't freeze. Finish up all winterizing of your hives. On a cold day when the bees are all inside, weed-eat around your hives. Enjoy Thanksgiving! Start purchasing next year's equipment. That's all for now, from Long Lane Honey Bee Farms, Sheri and I appreciate you and enjoy calling you our friends!! Great article! Reminds me of Proverb 16:18 .... "Pride goeth before destruction, and a haughty spirit before a fall." Praise God for His system of checks and balances! We reap what we sow. When someone is like this, I prevent resentment by telling myself it is none of my business; it is between that person and God! Thank you for your blog...I'm new to beekeeping and need all the help I can get! Blessings! Check Out Studio Bee Live. Here's How!